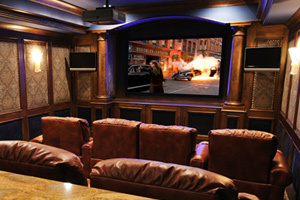 Experience the thrill of owning a custom designed home theater at an affordable price. Never before has the concept of a home theater been so real and achievable. With the right selection of equipment and proper room design, theater rooms and multi purpose rooms can deliver serious impact without breaking the budget. We have designed a variety of different theater packages to fit almost every budget.